What a ride today! We were able to test out the new drivetrain we got Dave (see photo at left). He reports that he LOVES it! The crankset is a Ritchey compact (50/34), with 172.5mm crank arms—much better for a tall guy like Mr. Underwood. We also got rid of the old cluster, replacing it with a new 12-28 cluster. So, if you're out on Poorman tomorrow, that hummingbird noise buzzing by you is Dave spinning his new drivetrain. 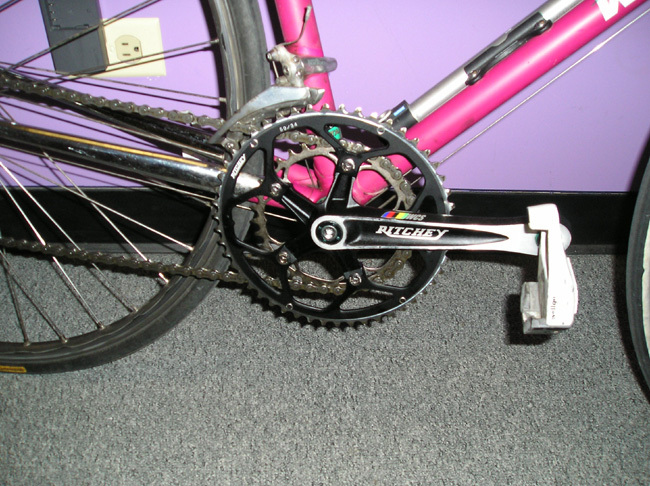 Rounding out the new equipment is a new chain, cuz why burn a new crankset and cluster with an old chain! Other frills that were throw in (for Dave's own personal safety): headset tightening, brake tightening, brake hub adjustment, and front wheel truing. Now, with all this newfound speed and knee-saving efficiency, Dave needn't worry about breaking his handlebars or losing control on the descents. Don't miss Wednesday's ride!! !